The history of Baldwin Packers dates back to 1836 when Dwight Baldwin, a doctor with the fourth company of American missionaries to Hawaii, settled on Maui. After seventeen years of service, Doctor Baldwin was granted 2,675-acres, the lands of the Mahinahina and Kahana ahupua’a, for farming and grazing. From that base, new lands were acquired until the holdings, known as Honolua Ranch, reached 24,500 acres in 1902. The business of Honolua Ranch included fishing, raising cattle and farming crops of taro, mango, aloe and coffee bean. Its ranch manager, David Fleming, was from Scotland. First, after careful study of resources, water was directed from streams and gulches, providing water and electricity to the new headquarters of Honolua Ranch which was moved from Honolua Bay to Kapalua, an area more suitable for agriculture. Likewise, Fleming reforested watershed land with sandalwood and koa. West Maui’s roots in the historic pineapple industry began in 1912, when Fleming began growing pineapple there; almost overnight the pineapple industry boomed. Honolua Ranch was soon renamed Baldwin Packers; at one time they were the largest producer of private label pineapple and pineapple juice in the nation. Baldwin Packers started pineapple canning in 1914 and at first its cannery was located close to its pineapple fields in the Honolua section. 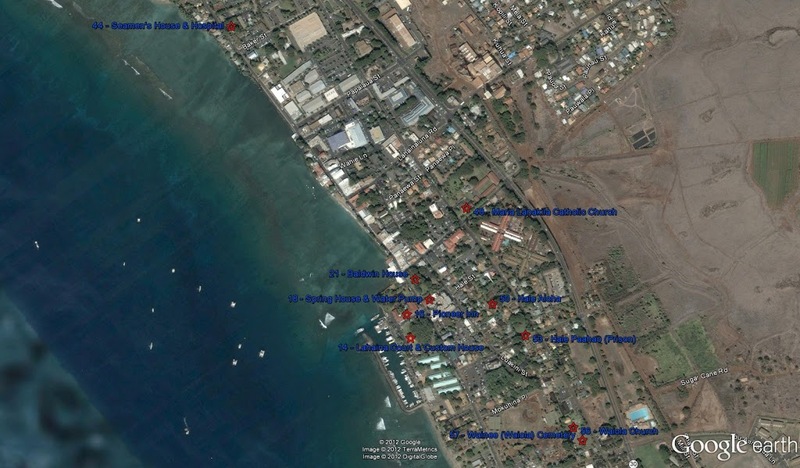 Difficulty in securing labor in the busiest seasons of packing and the distance of the haul from the cannery to Kaʻānapali, which was then its shipping point, made it advisable to secure a location nearer town. Baldwin Packers Pineapple cannery was eventually located at Lāhainā, this addressed transportation (proximity to Mala Wharf) and labor concerns. At Mala, the cannery was eight or ten miles from the fields and the fruit is transported to the plant by rail and truck. In 1922, Mala Wharf was built and it was hoped that this new pier would facilitate transporting the pineapple, however, it was discovered that the ocean currents at Mala Wharf were too treacherous for the ships to navigate safely. Produce had to be taken by barge to awaiting ships. By 1924, the Baldwin Packers Ltd. Cannery was producing 4,500 cases of canned pineapple per day. The pineapples were transported from the fields to the cannery by the Pioneer Mill Co. Railroad Line. By 1932, the roads have been improved enough to transport the fruit by truck to Kahului Harbor. The Baldwins became one of the Big Five families who dominated Hawaiʻi’s business community in the century before World War II, establishing a far-reaching business empire with holdings in agriculture, ranching, coffee, canning and other activities. The Baldwins’ growing and canning operations in Lāhainā continued for many decades. However, in 1962 the Baldwins’ east and west Maui holdings and pineapple operations were united when Baldwin Packers merged with Maui Pineapple Company. It was around that time that the Baldwin Packers pineapple cannery in west Maui was closed. One of the businesses spawned from the varied interests of the Baldwins was Maui Pine’s earliest direct predecessor, the Keahua Ranch Co., which was incorporated in December 1909 to control a portion of the family’s pineapple operations. In 1929 the Keahua Ranch Co. was renamed the Haleakala Pineapple Co., Ltd., three years before the pineapple operations of Haleakalā and Maui Agricultural Company were consolidated to create Maui Pineapple Company, Ltd.
J. Walter Cameron, a descendant of the Baldwin family, was appointed manager of the new company, presiding over its development for the next 30 years until a flurry of corporate maneuvers created the Maui Pine that existed during the 1990s. In August 1962, Alexander & Baldwin, a principal Baldwin family concern, merged three of its pineapple operations, Baldwin Packers, Ltd., Maui Pineapple Company, Ltd., and the old Haleakala Pineapple Company, to create what four months later became the Maui Pineapple Company, Ltd. In 1969, it became Maui Land & Pineapple Company, Inc. (ML&P), the largest employer on the island of Maui. The company’s president was Colin C. Cameron, a fifth-generation descendant of the Baldwin family. All operations were moved to the Kahului plant and the Lāhainā cannery plant was closed soon after. The idea of utilizing the old cannery site as a mall was first conceived in 1972. However, by 1985, the original cannery building had fallen to such disrepair that any hopes of renovation had to be abandoned, along with the original structure. In 1987, the Lāhainā Cannery Mall was built on the same site where the original plant once stood; it was designed to look like a pineapple cannery with the corrugated style and factory-like open conduits inside were adopted for the design. 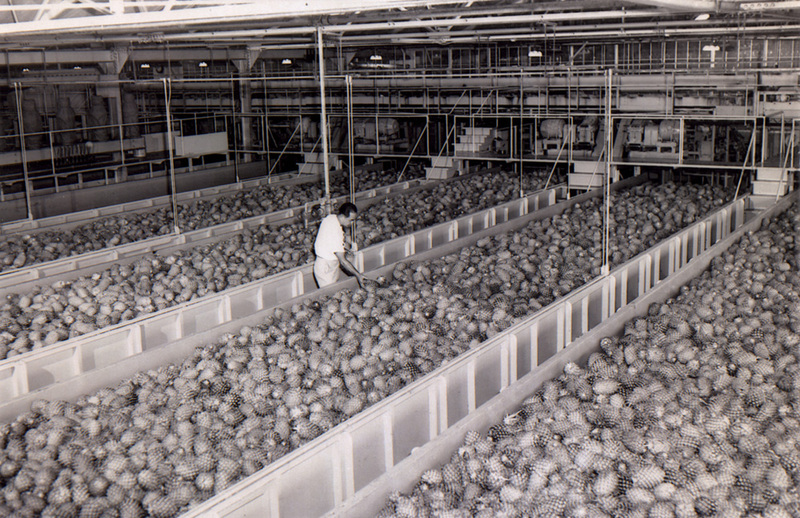 The image shows pineapples in the cannery (kapalua-com.) In addition, I have added other related images in a folder of like name in the Photos section on my Facebook and Google+ pages.